Okay everyone - you asked, so I'm using this week to answer! Last week I got more comments on my iRobot and my Lazy Susan table than anything else, so I decided to respond here and tell you what I think of my iRobots (Lazy Susan story to come next week). I'll start with my Happiness picture for this week and then share my thoughts on the iRobot. 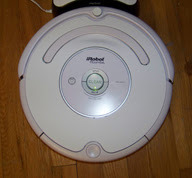 Regarding the iRobots: I use two - the iRobot Roomba (whom I call "Mr. La Forge" for his resemblance from the front to Geordi La Forge of Star Trek fame), and the iRobot Scooba (no name yet, but Peter says it's a "she" - and "she" mops!). 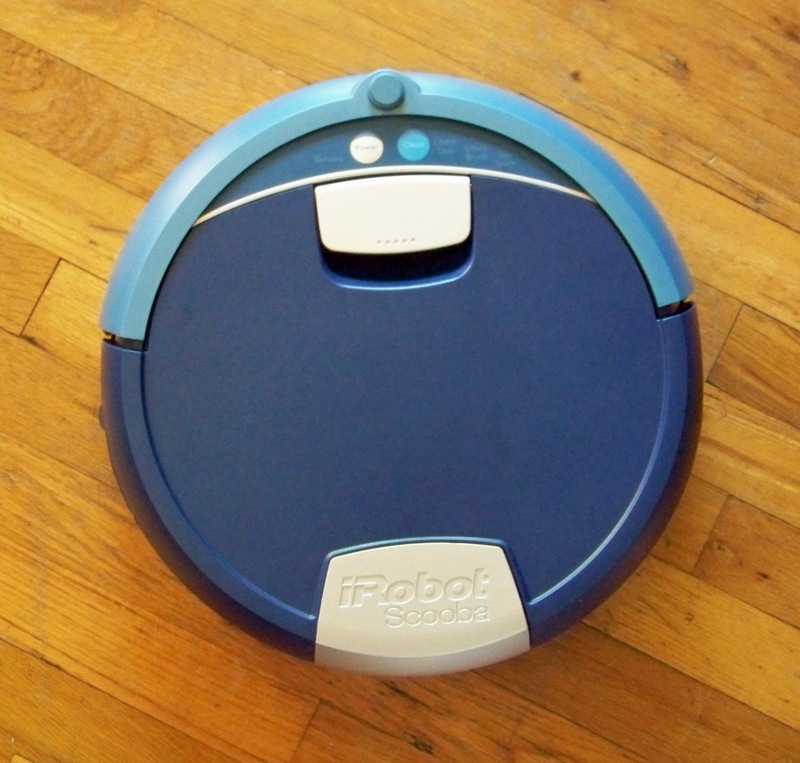 "Mr. La Forge" is our third iRobot - the first one stopped holding a charge, but as it was one of the first iRobot vacuums, we figured they had gotten better with time. The second iRobot first belonged to my mother, but she decided she didn't like it, so gave it to us (we didn't complain). "Geordi La Forge" entered our lives after finding a sweet deal on it at woot.com, and he has been sweeping for us ever since. Our iScooba is a fairly recent purchase (and my early-by-two-months birthday gift) and I'm still playing around with her. I'm open for name suggestions for Ms. Scooba! * It gets in places I don't - like under the bed, the dressers, and the couch - LOVE!! * Geordi has some issues and has to be taken apart and cleaned by the hubby on a (seems like to me) regular basis. I don't like that. * The battery on Mr. La Forge lasts for about 1.5 to 2 medium-sized rooms before it has to be re-charged - which takes about an hour or so to re-charge. * I'm not sure if it's a complaint or a good thing: when I use Mr. La Forge or Scooba, I move all the furniture and unplug all the lamps before I set them loose on the room. They have a tendency to pull lamps off of tables if you leave the cords dangling - not cool. However, while moving everything out of the way is more work for me, the rooms are also getting much cleaner than when I used the regular vacuum - that's a very good thing. So, I can go either way on that aspect of using them. I have no complaints about Scooba - yet. I haven't used her enough to be sure of what I like and what I don't like. I do know that she doesn't seem to recognize the virtual walls that came with our other iRobots, which means I basically have to baby-sit her while she's mopping to make sure she stays in the room that I want to clean. However, when you put her in a room with a door (unlike our living/dining/library rooms), all is well and she is able to work nicely on her own. And there you have it, my thoughts on the iRobots in our lives. It's rather strange - I'm not sure I would recommend that you go out and buy one, but if you found good deals on them (as we did on both Geordi and Ms. Scooba on woot), then it might be worth the money. I hate to clean, so anything that they will do that I don't have to do makes me happy. 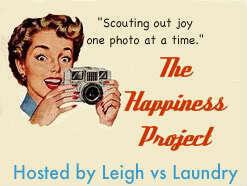 The Happiness Project at Leigh vs. Laundry has been postponed today due to Leigh dealing with sick offspring - hope they feel better soon! Love the cute snoopy and peanuts characters :) Definitly happy! I've heard nothing but good things about those iRobots. I'm pretty jealous. They sound really cool. I'm now thinking that they must be pretty pricey, because none of my friends have them. Or maybe they just aren't that well known yet? I think I would love one.